Alexey (left) and Oleg Navalny. The Uritsky district court of Russia’s central Oryol region has refused for the second time to release the brother of Russian opposition activist Alexei Navalny on parole. "The court has denied the parole of Oleg," Alexei Navalny said. Oleg Navalny’s lawyer drew the court’s attention to the fact that, while in prison, his defendant worked as a librarian with due diligence and replenished the library collection at his own expense, and also studied through a correspondence program. "Convict Navalny has received by post, read and transferred over 500 books to the colony," the lawyer said. Meanwhile, the colony’s representatives noted Oleg Navalny’s numerous violations of the internal regulations. They said, in particular, he did not comply with the command "lights out" and failed to make a report pursuant to the statutory form during a check while bread crumbs were found on the table in his prison cell. The colony’s administration and representatives of the prosecutor’s office said they deemed Oleg Navalny’s parole as inexpedient. On Dec. 30, 2014, Moscow’s Zamoskvoretsky Court found the Navalny brothers guilty of embezzling Yves Rocher funds and sentenced Alexey Navalny to a suspended sentence of 3 years and 6 months, while Oleg Navalny was sentenced to 3 years 6 months in a general-security colony. The court also ordered the Navalny brothers to pay over 4 million rubles ($65,000) in compensation under a lawsuit filed by Multiprofile Processing Company recognized as an affected party under the embezzlement case, and also fined each brother 500,000 rubles ($8,300). In late 2015, Alexei Navalny repaid all the liabilities both for himself and his brother. 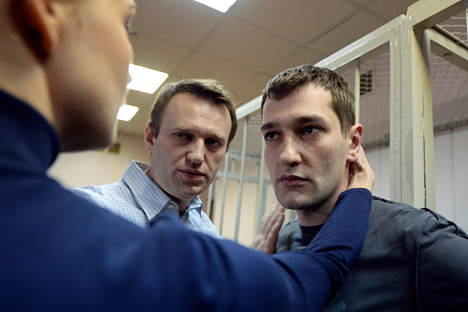 In July 2016, the Uritsky district court of Russia’s central Oryol region refused to order the release of Oleg Navalny on parole, saying that while granting parole, only behavior in a penal colony is taken into account.